Anberlin was an American alternative rock band formed in Winter Haven, Florida in 2002, disbanded in 2014, and reunited in 2018. Since the beginning of 2007, the band consisted of lead vocalist Stephen Christian, guitarists Joseph Milligan and Christian McAlhaney, bassist Deon Rexroat, and drummer Nathan Young. On December 15, 2017, it was announced that the band's former rhythm guitarist Nathan Strayer had died. He was 34. On October 18, 2018, the band announced that they would reunite for one show on December 14 at the Yuengling Center in Tampa, Florida, as part of Underoath's Erase Me Tour. 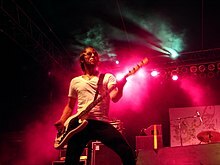 The band also performed a headlining show the day before at The Orpheum. In March 2019, it was announced that the band would perform a series of headlining shows across Australia in May 2019. In April 2019, the band announced a 22-stop U.S. tour. Young revealed the band had no plans to stage a comeback after the reunion shows. ^ Collar, Matt. "Vital - Anberlin". AllMusic. Retrieved June 30, 2016. Although Anberlin have never shied away from angular sounds, much of the band's previous work revealed a mix of sparkling, U2-style uplift and plaintive, Paramore-style emo. ^ "Anberlin Biography". Tooth & Nail. Retrieved April 25, 2009. ^ "Norah Stays Tight at No. 1 Amidst Slow Sales Week". Billboard. Retrieved April 25, 2009. ^ a b "AbsolutePunk". AbsolutePunk. Archived from the original on May 30, 2008. Retrieved May 29, 2008. ^ a b "Artist Albums Charts History for: Anberlin". Billboard. Archived from the original on August 10, 2014. Retrieved August 11, 2008. ^ "Hot Modern Rock Tracks - Feel Good Drag". Billboard. Retrieved April 24, 2009. ^ "Tooth and Nail Press Release". Retrieved January 28, 2014. ^ a b "Anberlin Breaking Up After Final Album & Tour". KROQ. January 17, 2014. Retrieved January 18, 2014. ^ a b Perez, Omar (July 24, 2003). "Change the World". Orlando Weekly. Retrieved July 19, 2004. ^ a b "Anberlin -- We the Wanderers". Archived from the original on August 5, 2008. ^ "SputnikMusic -- Anberlin Never Take Friendship Personal". ^ "Artist Singles Chart History for: Anberlin". Billboard. Retrieved August 11, 2008. ^ "LIFE: Anberlin's "Cities" best album of 2007 so far". Archived from the original on November 13, 2007. ^ "Live with Stephen Christian and Nathan Strayer". ^ "Jesus Freak Hideout's 25 Most Anticipated Albums of 2007". JesusFreakHideout.com. Archived from the original on December 6, 2008. Retrieved November 14, 2008. ^ Kohli, Rohan. "Anberlin Parts Ways With Guitarist". AbsolutePunk. February 19, 2007. Retrieved May 1, 2007. ^ "Anberlin finds 'Lost Songs' on the road". Live Daily. November 28, 2008. Archived from the original on February 17, 2008. Retrieved May 20, 2008. ^ "Anberlin Showcase New Song Disappear From Album New Surrender". get2sammyb.co.uk. July 11, 2008. Archived from the original on October 6, 2008. Retrieved July 11, 2008. ^ "Radio date for new Anberlin single". AbsolutePunk. July 18, 2008. Archived from the original on July 26, 2008. Retrieved July 19, 2008. ^ "Feel Good About Helping Anberlin". AbsolutePunk. Retrieved January 9, 2009. ^ "Anberlin Hit Studio for Universal Republic Debut". Ultimate-Guitar.com. January 15, 2008. Archived from the original on January 20, 2008. Retrieved January 18, 2007. ^ "Anberlin post studio update". drivenfaroff.com. February 12, 2008. ^ "Jesus Freak Hideout's 25 Most Anticipated Albums of 2008". JesusFreakHideout.com. Archived from the original on January 29, 2008. Retrieved February 1, 2008. ^ Hasty, Katie (October 8, 2008). "T.I. Debuts Big Atop Billboard 200, Hot 100". Billboard. Archived from the original on October 9, 2008. Retrieved October 8, 2008. ^ "Anberlin Debuts at No. 13 on Billboard Top 200 and No. 5 on Top Current Rock Chart with New Surrender". MarketWatch. October 8, 2008. Retrieved October 8, 2008. ^ "Video: Anberlin Does Danzig, Talks "Surrender"". Billboard. Retrieved August 2, 2009. ^ "TV > Interviews > Anberlin (video)". Rock Sound TV. Retrieved December 30, 2008. ^ "Anberlin to tour Australia with The Academy Is..." Alternative Press. Archived from the original on June 3, 2009. Retrieved June 1, 2009. ^ "Anberlin Cover Hitting Radio - News Article". AbsolutePunk.net. Retrieved July 6, 2010. ^ "Interview with Nate and Christian of Anberlin". Stardust. June 21, 2009. Retrieved December 9, 2009. ^ "Anberlin News". Absolute Punk. Archived from the original on December 15, 2009. Retrieved December 9, 2009. ^ "Anberlin Begin Recording". AbsolutePunk. Archived from the original on March 2, 2010. Retrieved March 4, 2010. ^ "Anberlin Announce Producer". AbsolutePunk. Retrieved March 4, 2010. ^ "Something Close To Cities Please". Absolute Punk. Archived from the original on April 14, 2010. Retrieved April 19, 2010. ^ "Anberlin Mixing". Absolute Punk. Retrieved April 19, 2010. ^ "Stephen Christian Talks Anberlin and Faceless International". MyYearbook. MyMag. Retrieved April 19, 2010. ^ "WATCH:Mastodon, Rob Zombie, Anberlin Spin Magazine Online". SPIN Magazine. SpinInterview. Archived from the original on May 27, 2010. Retrieved May 31, 2010. ^ "New Anberlin in September". Absolute Punk. Retrieved July 3, 2010. ^ "New Anberlin Tune". Absolute Punk. Retrieved July 3, 2010. ^ "Anberlin Press Release". Absolute Punk. Archived from the original on June 24, 2010. Retrieved July 3, 2010. ^ "First Single From New Album Hits Radio In July". FMQB. Archived from the original on March 25, 2010. Retrieved March 6, 2010. ^ "Stephen Answers Questions". myyearbook.com. Retrieved April 6, 2010. ^ "Anberlin and CB7 Join Closer to the Edge Tour". Capitol Music Group. March 21, 2011. Retrieved March 22, 2011. ^ a b "Stephen Christian Interview May 2011". Common Revolt. May 10, 2011. Retrieved May 10, 2011. ^ "Anberlin On How the Egyptian Uprising Inspired 'Someone Anyone' - Video News - Fuse". Fuse.tv. November 27, 2012. Retrieved May 17, 2014. ^ "Anberlin - Vital (2012)". AbsolutePunk.net. Retrieved August 30, 2012. ^ Ableson, Jon (August 20, 2009). "Anberlin Announce New Album "Vital" Release Date". Alter The Press!. Retrieved May 17, 2014. ^ "Anberlin's 'Self-Starter': Exclusive First Listen". Billboard. August 17, 2012. Retrieved May 17, 2014. ^ "Twitter / anberlin: NEW JAM! Someone Anyone. Check". Twitter. August 22, 2012. Retrieved May 17, 2014. ^ Interview: Anberlin October 26, 2012 Angela Mastrogiacomo 0 (October 26, 2012). "Interview: Anberlin". Infectious Magazine. Retrieved September 20, 2013. ^ "iTunes Music - City Electric - Single by Anberlin". iTunes Store. September 24, 2013. Retrieved January 16, 2014. ^ "iTunes Music - Devotion by Anberlin". iTunes Store. October 15, 2013. Retrieved January 16, 2014. ^ "Final Album, Final Tour". Anberlin. May 6, 2014. Archived from the original on May 15, 2014. Retrieved May 17, 2014. ^ "Anberlin announce another batch of farewell tour dates, including their last show ever - News - Alternative Press". Alternative Press. Retrieved July 10, 2017. ^ "Nathan Passes: Former rhythm guitarist with Anberlin, Nathan Strayer dies". Crossrhythms.co.uk. Retrieved December 22, 2017. ^ "Anberlin to Reunite for Underoath Hometown Show". Alternative Press. Retrieved October 19, 2018. ^ Langford, Jackson. "Anberlin Announce 2019 Australian Tour". Music Feeds. Retrieved March 13, 2019. ^ Campbell, Rachel. "ANBERLIN ANNOUNCE FIRST TOUR IN FIVE YEARS". Alternative Press. ALTERNATIVE PRESS MAGAZINE. Retrieved April 9, 2019. ^ brownypaul (April 16, 2019). "Don't expect Anberlin to make a comeback after their reunion shows". Wall Of Sound. Retrieved April 16, 2019. ^ a b Bryson, Scott (July 12, 2006). "Anberlin Aren't Christian Rock, But It's OK If You Call Them That". Chart. Archived from the original on December 6, 2008. Retrieved November 17, 2008. ^ Stavrinos, Nicole. "Music: Anberlin". NOISE. October 11, 2006. Archived from the original on July 5, 2007. Retrieved May 1, 2007. ^ "Interview With Anberlin". Europunk.net. June 3, 2003. Archived from the original on March 25, 2007. Retrieved May 1, 2007. ^ McCrae, Jessica (September 2003). 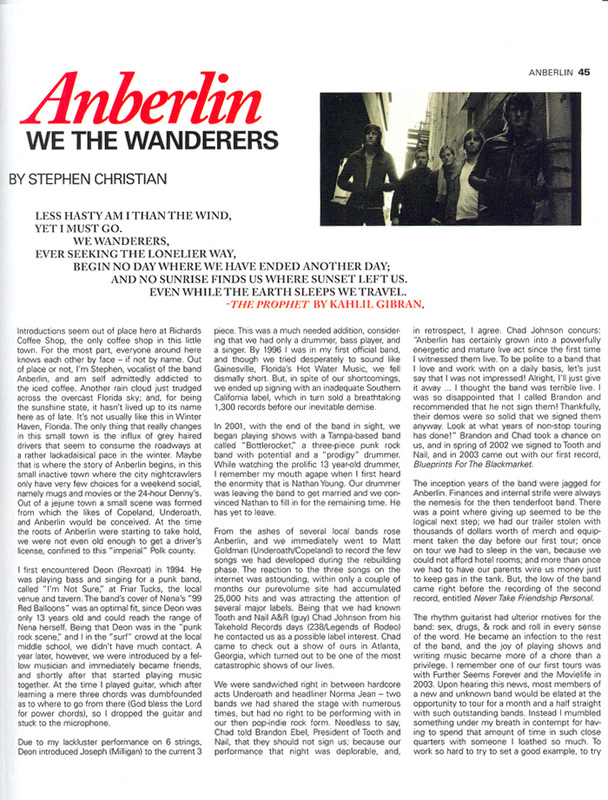 "Anberlin - Interview, Sept. 2003". HM. Archived from the original on December 6, 2008. Retrieved August 10, 2008. ^ "Anberlin interview". Soundcheck.Walmart.com. Archived from the original on August 28, 2008. Retrieved August 18, 2008. ^ "Anberlin". BeatTheScene.com. Archived from the original on August 1, 2008. Retrieved August 11, 2008. ^ Hassani, Laila (September 23, 2007). "Anberlin". New-Noise.net. Archived from the original on October 15, 2007. Retrieved August 10, 2008. ^ "Florida-based band Anberlin to play the Basement May 1". ThisWeek Community Newspapers. April 26, 2007. Retrieved January 13, 2009. ^ "MusicMoz -- X 2003- Experience The Alternative". ^ "Amazon -- X 2007". ^ "Anberlin | Christian Music - Gospel Music Channel". Gospelmusicchannel.com. Archived from the original on August 28, 2008. Retrieved October 27, 2008. 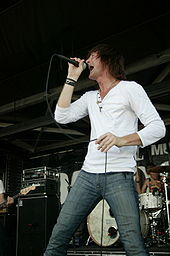 ^ "Anberlin's Stephen Goes Off". HM Letters to the Editor, HM Online Exclusives. Archived from the original on January 29, 2009. Retrieved January 5, 2009. ^ "The Joy FM Radio Interview". ^ "Smartpick of the Month - Anberlin". Smartpunk. Archived from the original on September 22, 2008. Retrieved September 9, 2008. ^ "Anchor & Braille Release Date, Track List". AbsolutePunk. Retrieved June 18, 2009. ^ "EP, by LOOSE TALK". LOOSE TALK. Retrieved July 7, 2016.